This story is filled with errors. 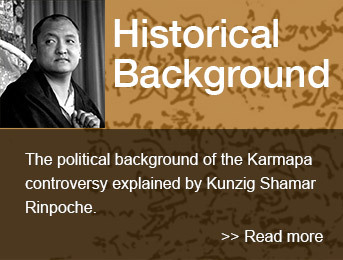 Two main points stand out, Dronyer Ngodrub and Dechang Nagu, speaking in their twin roles as brothers of Damchoe Yongdu and members of the Karmapa’s administration. First, Tenzin talked of blotches on Damchoe’s body as possible signs of poison. But poison leaves more obvious signs than this and is generally very easy to detect by physicians. Second, the family had the body at home and did pujas over it for a week. During that time there would have been plenty of opportunity to schedule an autopsy. However, the family felt no need to do this. Damchoe Yongdu’s two brothers tell a different version of the story of the death of their brother. “I was in Thimphu, Bhutan assisting my brother. It was December, and my brother was staying at a small dry goods shop in Thimphu run by our brother-in-law, Lodro Choden,” Dechang Nagu explains. Damchoe had made an appointment to meet the Bhutanese finance minister at 10:30 am at his office in the main government building in Thimphu. At 8 o’clock, before setting out, Damchoe met with Topga Rinpoche and his wife Princess Ashi Chokyi at their residence in the city. From Topga Rinpoche’s house, Damchoe left for his meeting with the finance minister. It took about one hour for the meeting, then Damchoe came back to the shop at lunchtime. Lodro Choden was working downstairs, and Damchoe was in the guest room upstairs. Suddenly, Lodro Choden heard a sudden loud thump on the ceiling above him. He went upstairs to see what had happened, and Damchoe was sprawled on the ground, collapsed. Lodro Choden ran downstairs to summon a doctor. Within a few minutes, a local doctor arrived. Dechang was out walking in Thimphu on the morning of his brother’s death. When he returned to his brother-in-law’s house, he found the doctor there and his brother dead. They talked, and the doctor explained that he had done an examination of Damchoe’s body, which showed all the signs of a heart attack. This was no surprise to Dechang.